Home / FOOD & DINE / DOMINO’S PIZZA STEPS UP THE ANTE, PRESENTS LATEST PULLED-MEAT PIZZAS! DOMINO’S PIZZA STEPS UP THE ANTE, PRESENTS LATEST PULLED-MEAT PIZZAS! Living up to its promise of delivering quality products, service, value and convenience, Domino’s Pizza is introducing its latest addition to the menu with its range of Pulled-Meat pizzas. Derived by Malaysian’s love for western inspired meals when dining together in celebration of special moments, the pulled-meat pizzas are a perfect way to indulge. 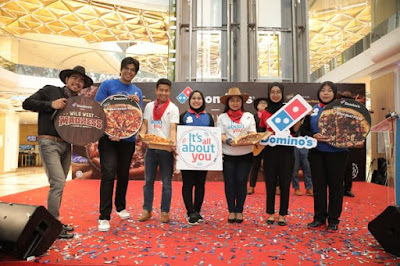 The launch of Domino’s latest Pulled-Meat Pizzas was held and sponsored by Evolve Concept Mall located in Ara Damansara. Serving customers only the best, high quality Australian beef with characteristics that meets Domino’s standard is selected as the centerpiece of the new pizzas. The new Pulled-Beef Pizza features unbelievably tender pulled meat briskets heavily drenched in a flavorful Chipotle sauce along with capsicums and red chilies for the ultimate sweet and spicy kick to satisfy your meat cravings. The secret to tender meat is the five-hour cooking procedure. It starts off with the marination to infuse the flavors into the meat’s pores followed by a 15-minute ‘tumbling’ process to massage the meat. It is then oven-braised for at least five hours until it falls apart, ready to be easily shredded or ‘pulled’ apart to serve. The latest range also presents the new Pulled-Chicken Pizza that highlights the pulled chicken breasts paired with Chipotle sauce, bright cherry tomatoes and caramelized pineapple rings that create a well-balanced, sweet and savory combination in every bite. In keeping with the western flavors, new Golden Chicken Tenders is a perfect complement to the pizzas. Boneless chicken tenders are impeccably marinated, battered then oven baked (never fried) to perfection so every bite is crispy yet soft and tender on the inside, while served with the new Zesty Coleslaw of crunchy mix of purple and white cabbage, sweet orange carrot and tasty tangy lime dressing, topped with savory sprinkle of black sesame seeds. “Although we are in the Quick Service Restaurant (QSR) industry, we do not let it get in our way of serving top-quality products that are usually served in high quality restaurants. We are passionate in everything that we do, as such a ton of effort and time has gone into making this a reality. Our menu now offers more choices than ever before while also keeping customer’s pocket in mind. Not only do we offer customers more options but we also present customers with premium products that consist of top-quality ingredients to enjoy with their loved ones. We are constantly engaging and listening to our customers and we understand that they love quality ingredients. This launch truly captures our new brand promise of It’s All About You, to continuously serve and demonstrate to customers that they are valued by us,” he continued. With heartfelt appreciation and gratitude as well as with customers in mind, the launch also featured Domino’s brand new video of Its All About You. For even greater value, customers can opt for the Wild West Buddy Combo consisting of any NEW Pulled-Meat pizza for only RM41.90 and Wild West Super Combo for only RM61.90. Additionally, customers can add-on RM12.75 or Ala-carte RM13.70 to enjoy our new Golden Chicken Tenders. Customers also get the choose to add-on RM6.50 for Large Zesty Coleslaw or add-on RM2.90 for Small Zesty Coleslaw which are also available ala-carte for only RM 7.90 and RM3.90 respectively. The all-new Pulled-Meat Pizzas and Golden Chicken sides are available in Domino’s Pizza stores in West Malaysia from November 5, 2018 onwards. Visit Domino’s stores, order online at http://www.dominos.com.my/, or call 1300-888-333 to make an order. 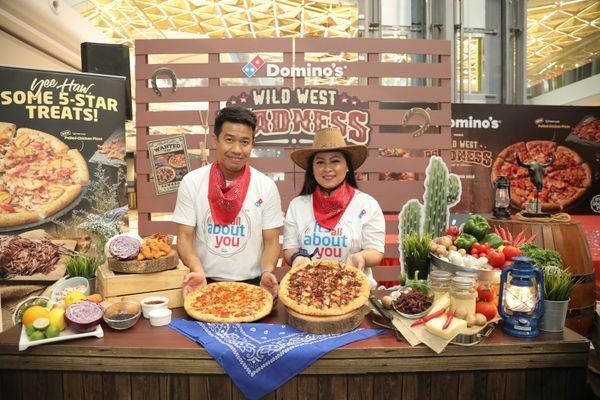 To learn more about Domino’s Pizza Malaysia’s new Western-themed products as well as other ongoing promotions, visit us at http://www.dominos.com.my/. Domino’s Pizza Malaysia is the largest Domino’s market in Southeast Asia and fifth largest in Asia Pacific. Established in 1997, Domino’s Malaysia is managed by master franchise holder, Dommal Food Services Sdn Bhd. To date, there are 226 Domino’s Pizza stores in the country. Forging ahead as an e-commerce entity, Domino’s Pizza has led many firsts in its digital platforms. Domino’s Pizza Malaysia has leveraged on the digital world to the best of its advantage and this began when it was certified as the first QSR company to provide an online ordering platform by the Malaysian Book of Records with the launch of its website in 2003. Domino’s is the award winner of the 2009, 2010, 2011, 2012 and 2016 Gold Franny Award, a distinguished Achievement Award of the International Franchise Association at the Domino’s Pizza Worldwide Rally. In a show of confidence by Malaysian consumers, Domino’s Pizza won Bronze in the "Restaurant & Fast Food" category of the prestigious Putra Brand Awards 2014, silver in 2015, bronze in 2016, Silver in 2017 and Bronze in 2018. Customers can call Domino’s at 1-300-888-333 or log on to its website at www.dominos.com.my to place their orders. For latest updates, please visit Domino’s Pizza Malaysia’s Facebook at https://www.facebook.com/DominosMY/ or Instagram at https://www.instagram.com/dominosmy/.